Lintrose Roman Temporary Camp, oblique aerial view, taken from the ESE. Lintrose Roman Temporary Camp, oblique aerial view, taken from the E.
Lintrose Roman Temporary Camp, oblique aerial view, taken from the NE, centred on the N angle of the camp. For discovery of Roman coins at Campmuir (NO 220 377), see NO23NW 18. This temporary Roman camp was discovered in 1754 by Captain R Melville. In Roy's time, about 3/4 of it was visible, but when visited by Crawford, who considers its plan as shown on OS 6", 1863 is correct, only the E end of the S side, and a small adjacent part of the E side, both in a wood; also about 300' of the N side near the NW corner, between it and the road from Campmuir to Coupar were visible. 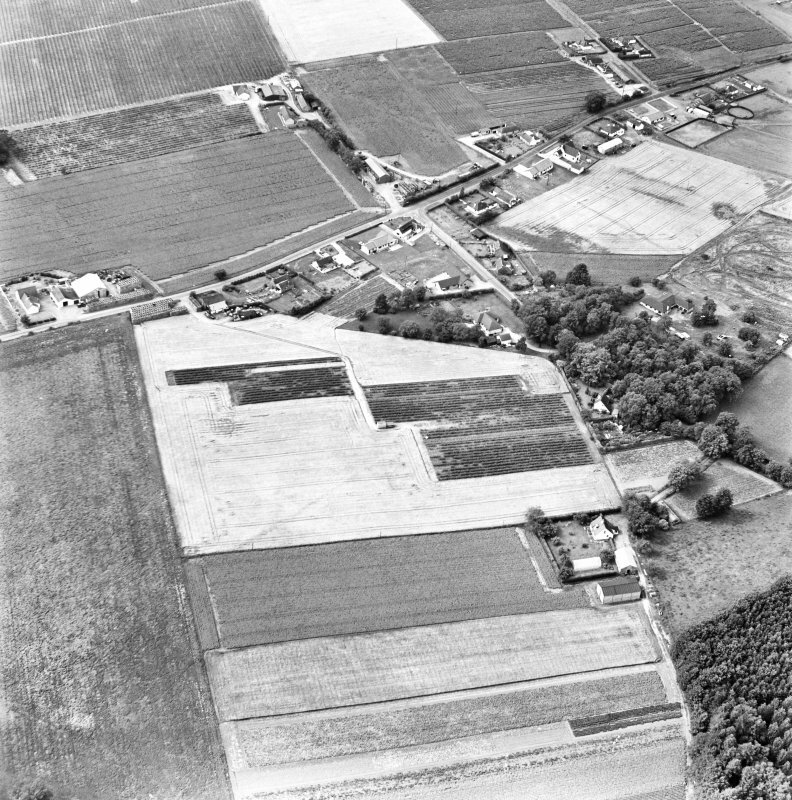 A short part of the W side was visible in 1925 as a bank forming the boundary between two fields, but it is now oscupied by bungalows and gardens. APs show parts of the N and E sides, with a slight change of direction in the middle of the N side, as if at a gate. A. NO 2177 3790 - NO 2186 3788. Well-preserved bank 8.5m broad, but difficult to see due to vegetation and refuse being dumped on its S side, filling the ditch, the best part being its W extremity. B. NO 2168 3769 - NO 2167 3763. Bank preserved as a field division with a hedge on top. C. NO 2167 3763 - NO 2167 3760 and NO 2209 3740 - NO 2216 3738. No traces whatsoever in a raspberry field. D. NO 2226 3763. Bank preserved in wood, exactly as shown. 6.0m overall width, 1.0m high. Faint trace of angle 0.2m high noticeable in field outside wood. E. NO 2186 3746 - NO 2189 3746. Modern field bank with internal ditch exactly on course of rampart. F. NO 2199 3743. Mound visible in field hedge boundary - 0.7m high - on course of rampart. G. NO 2216 3738. Stony mound in field bank 1.2m high, 7.0m overall width. H. NO 2231 3758 - NO 2228 3747. 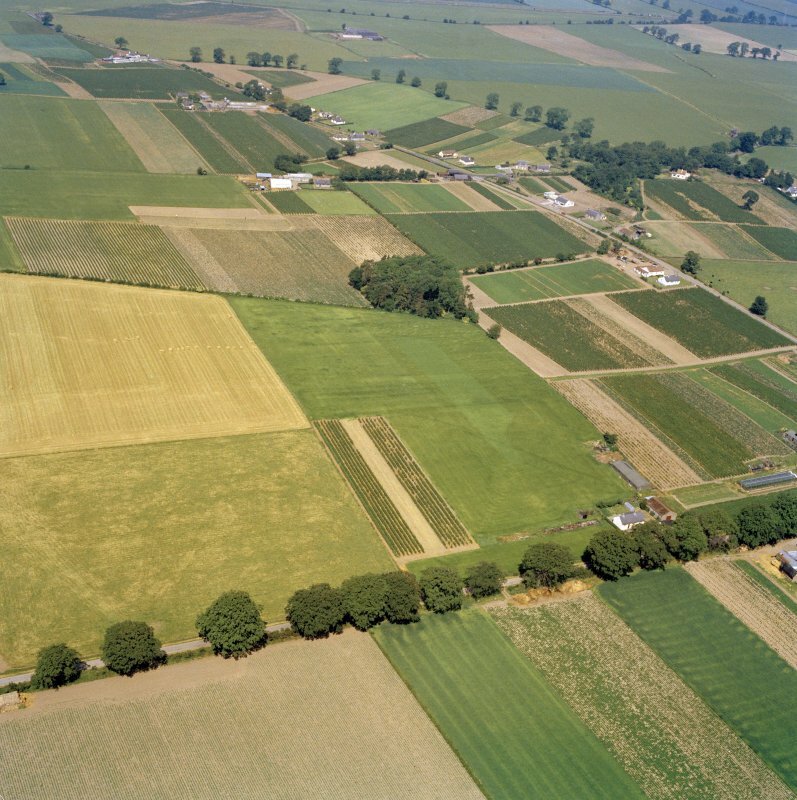 Course visible on APs (CPE/Scot/UK 230, 4269-70) but no vestiges in pasture field. J. NO 2233 3777 - NO 2233 3770. Ditch 1.8m deep and outer bank 6.0m broad by 1.2m high; width of base of ditch 2.0m high. The curve of these earthworks does not fit into the plan normally expected for the NE angle and the feature strongly resembles an old covered-way - possibly a track in connection with the disused quarries here. General Sir Thomas Riddell-Webster of Lintrose believes that this is the NE angle of the camp and that the Romans broke away from traditional lines to take advantage of the natural defences of the deep glen, but this theory is open to speculation, and these earthworks cannot be accepted as part of the camp until expert opinion has been given. To date, local informants have been unable to give an opinion on these features. Elsewhere, the course of the camp falls mainly in strawberry fields and no traces are visible. The camp well at NO 2192 3746 has now been completely erased. Some of the slopes have been destroyed where a corner of Beech Wood (at 2223 3736) has been felled and levelled and taken in with the adjoining field. A building has also been erected alongside the new fence over the slopes. Immediately W of Lintrose House there are the last surviving traces of a Roman marching-camp, enclosing about 26ha and measuring about 625m by 420m. Only a few short stretches of the enclosing rampart and ditch now survive (notably the short sectors of the E and S sides immediately adjacent to the SE angle, where the rampart appears as a bank 6m thick, and a length of about 100m of the N side near the NW angle. 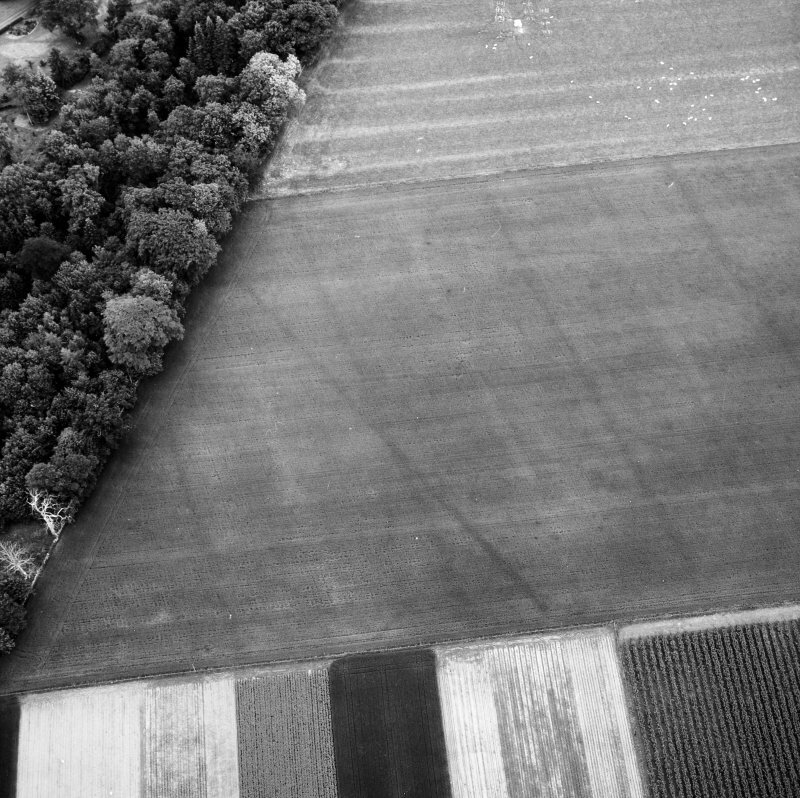 Cropmarks recorded on air photographs, however, confirm and add to the plan drawn by Roy, a gate with a traverse now being known in the E half of the S side, while the slight change in alignment of the defences 160m to the E probably indicates the position of another. The only other entrance known is the one placed centrally in the W side, now obscured, but depicted by Roy as provided with an external traverse. Information from RCAHMS (JRS) 10 December 1992. NO 220 376 (centre) A watching brief was carried out between August 2003 and February 2004 on groundworks for a new house to be built partly over a Roman temporary camp of Severan date (NO23NW 5). The area topsoiled encompassed parts of the interior, the ditch and exterior of the camp. The defensive ditch was found and a 0.75m wide section was excavated. 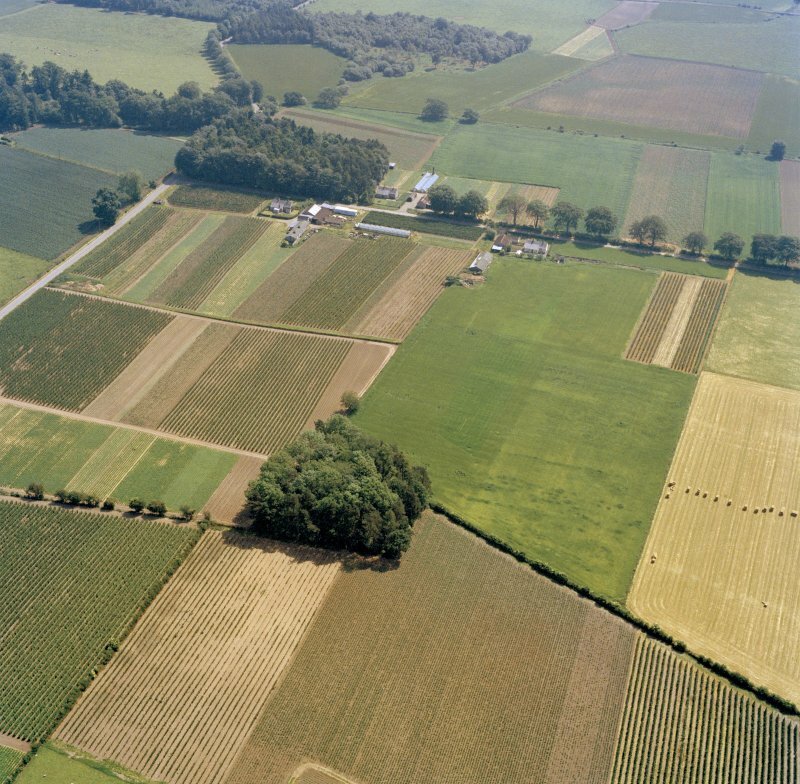 The ditch had a standard Roman V-shaped profile, measuring 2.3m across with a depth of 0.75m. No dating evidence or artefacts were recovered. An irregular-shaped patch of burning, characterised by a surrounding ring of heat-affected orange sand, was interpreted as a hearth. The feature measured 1m across and had a depth of 0.11m with sharp edges and a flat bottom. The fill comprised a charcoal-flecked mid-brown silty loam and a deposit of charcoal. It was uncertain as to whether the feature was contemporary with the Roman camp. A further watching brief on the foundation trenches revealed an additional section of the defensive ditch in a foundation trench for the new house. No dating evidence or artefacts were recovered. A narrow (0.18m) ditch was found in the same foundation trench, on a slightly different alignment to the defensive ditch. The silt fill contained small fragments of porcelain. This was judged to be a modern drainage feature. been removed during modern landscaping of the area. An archaeological evaluation was carried out in respect to the proposed residential development on Greenacre, Campmuir (NO 21872 37796). The archaeological works were designed to inform the appropriateness of granting planning consent and inform the development of any appropriate mitigation of impact on archaeological remains should they be present within the development area. The archaeological evaluation works uncovered no significant archaeological deposits and no anthropic material other than that which related to twentieth century use of the site. No remains of the linear earthwork visible on the 1st edition Ordnance Survey were present, any remains appearing to have been removed in modern times during clearance of the area for landscaping. The camp at Lintrose was discovered by Captain Robert Melville in August 1754 (Balfour-Melville 1917: 123n; Jones and Maxwell 2008), and planned by Roy the following year (Roy 1793: Pl. XIV). When Roy planned it, the whole of the WNW side, most of the SSW side and parts of the other two sides were upstanding, including a titulus in the WNW side. 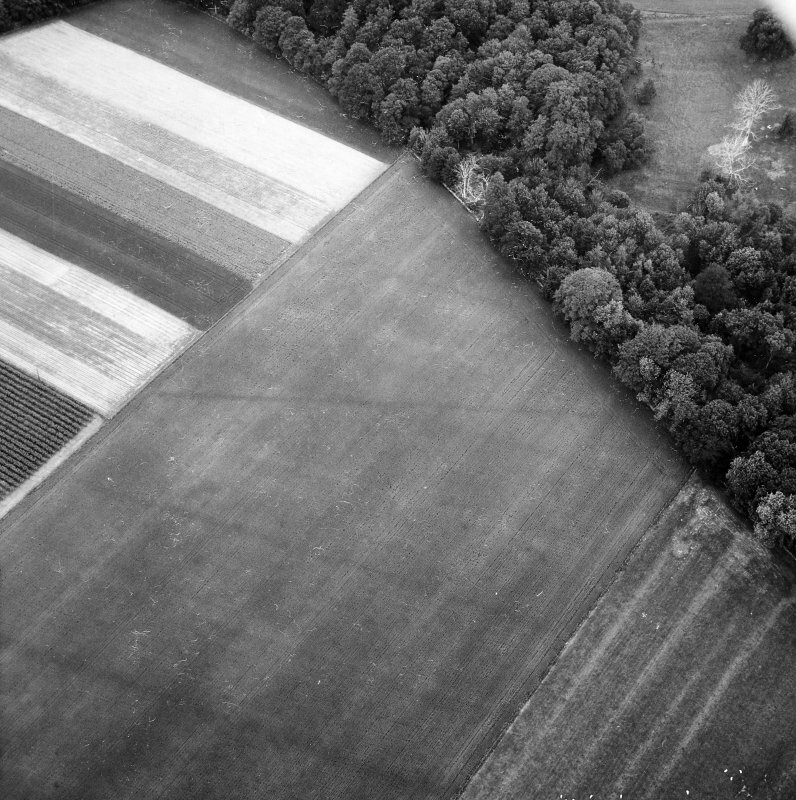 When Crawford visited the site in 1925, small stretches of the WNW and NNE sides were visible, along with two short stretches adjacent to the south-east corner (1949: 85–6). Today, only the small stretches of upstanding rampart close to the south-east corner and a stretch of the NNE side close to the north-west angle can be detected. The stretch of the WSW side south of the main road through the camp is barely visible as an earthwork. 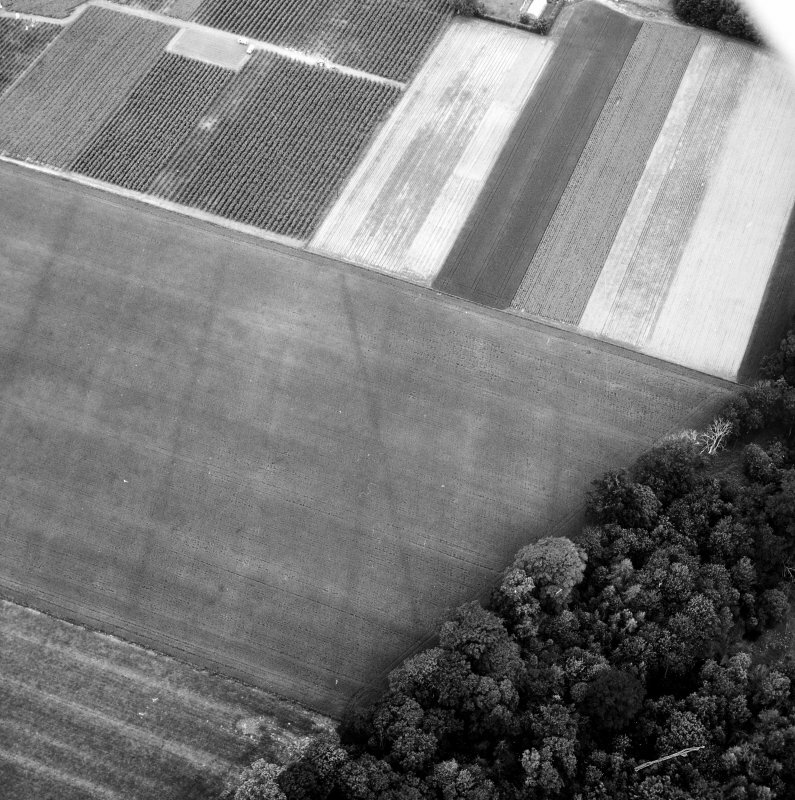 Much of the remainder of the camp is now known through cropmarks on air photographs. 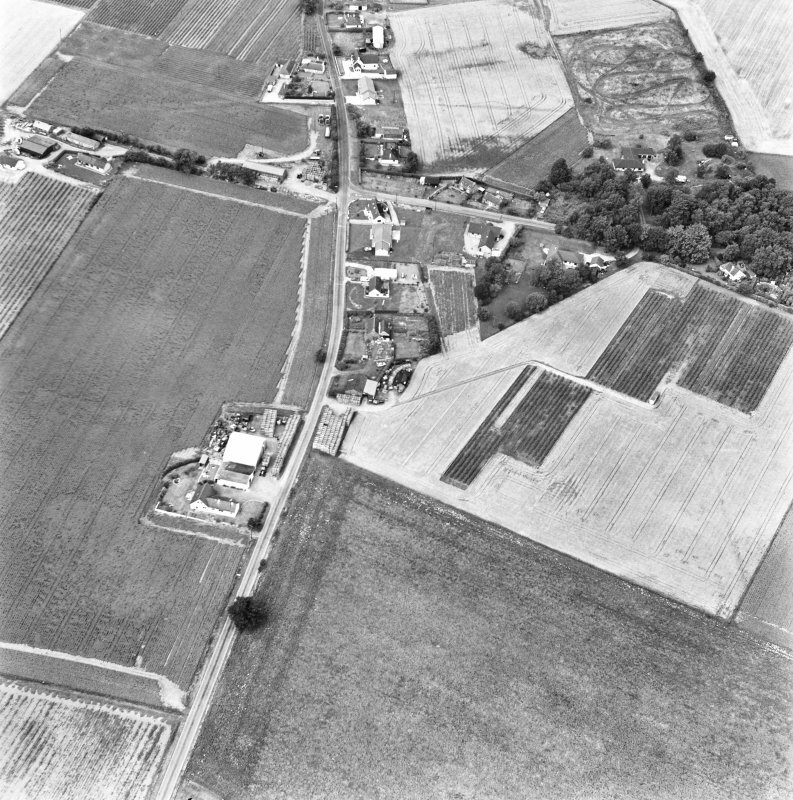 The camp lies about 2km south of Coupar Angus, on level ground west of Lintrose House at the village of Campmuir; the Kinnochtry Burn runs along its east side. It measures about 624m from WNW to ESE by about 404m transversely, enclosing 25ha (62 acres). The titulus that Roy recorded in the WNW side is no longer detectable, but there is an entrance gap and titulus in the SSW side, towards the eastern part of that side. The size and layout of the two recorded entrances suggest that the camp originally had six gates. The rampart of the camp survives in a few stretches up to a maximum of 6m in width and 0.7m in height. 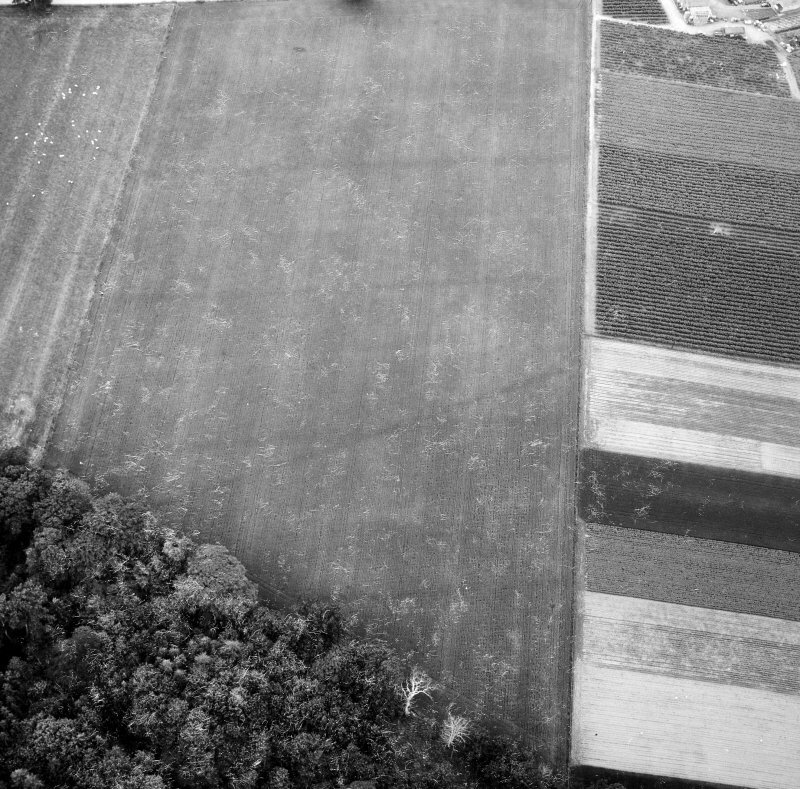 Excavations in 2004 recorded that the ditch was V-shaped, measuring 2.3m in width and 0.75m in depth. These also noted a hearth feature of date within the camp (Hunter 2005: 393, fig 6). 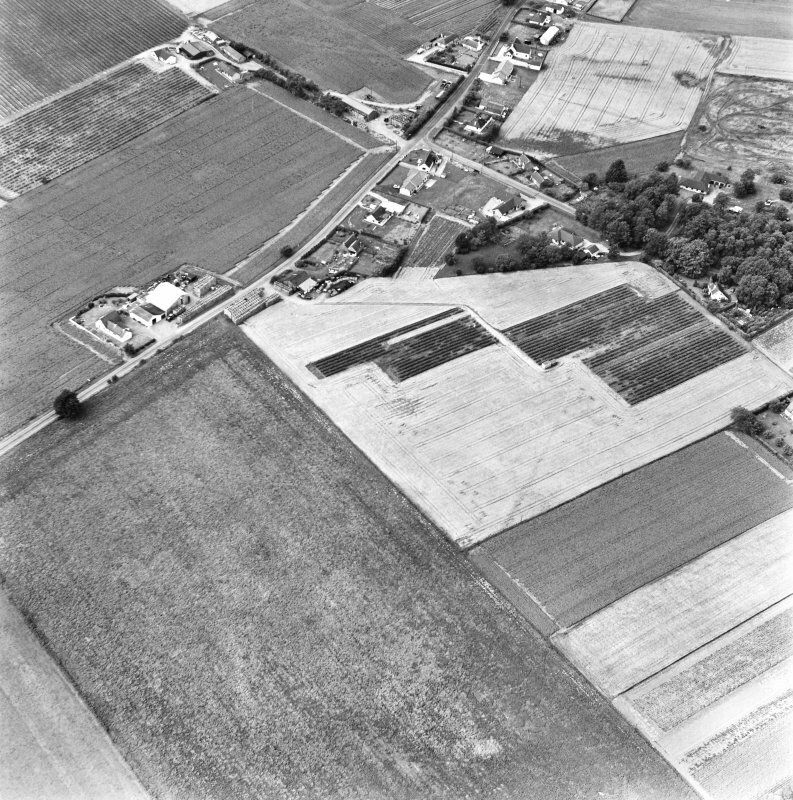 The OS noted that an earthwork in Packmanley Wood, on the ESE side of the camp, had been proposed as its north-east corner by General Sir Riddell-Webster of Lintrose, but that it could be the remains of a track (OS Recorder 1958). NO 21639 37792 A watching brief was carried out on 2 November 2011 during topsoil stripping in the footprint of a new house and garage to the W of Hillview. Three small cut features of Victorian/early modern date were investigated, but nothing relating to the Roman temporary camp of Lintrose was located. NO 2188 3774 (NO23NW 5) A series of watching briefs was undertaken, 7 December 2015 – 5 March 2016, during the excavation of foundation trenches for a new house, garage and a septic tank on land 50m N of Harris, within the Roman Temporary Camp of Lintrose. No finds or features of archaeological significance were recorded. interpreted as possibly being either the former road line from Perth to Coupar Angus shown on 18th-century maps or an agricultural boundary. NO 2218 3746 (NO23NW 5) A watching brief was carried out, 28 April – 1 May 2017, during topsoil stripping and the excavation of foundation trenches for a new house on land adjacent to 30 Holdings, within the limits of the Roman temporary camp. Nothing of archaeological interest was located.